Tell me then? The common ingredients for our Malaysian local desserts (Kuih Gula Melaka, Payasam & Pandan Coconut Jelly)? Coconut, sago, Gula Melaka/palm sugar, daun pandan/screwpine leaves and other local produce right? Of course if you are asking me (Malaysian Sago Pudding, Saffron Poached Pears & Sago Gula Melaka). Play around with these ingredients and without you realising, you will be a Malaysian dessert winner. Pretty much what I do mostly (Coconut Panna Cotta, Bubur Cha Cha & Bubur Kacang Hijau), of course, there is the baking I do whenever my baking mode is alerted (Lemon Bars). Otherwise, like I have already told you, nothing can come to our locality. Take this Pumpkin Sago Dessert for the matter. Easy-preasy and never will ever let us down (Honeydew Sago). 1/2 cup sago - soak for 1/2 hour and gently rinse under running water. Simmer sago with enough water till translucent. Drain off water, rinse and keep aside. Remove leaves and add translucent sago. Stir and pour in coconut milk. Stir, heat through and remove from heat. 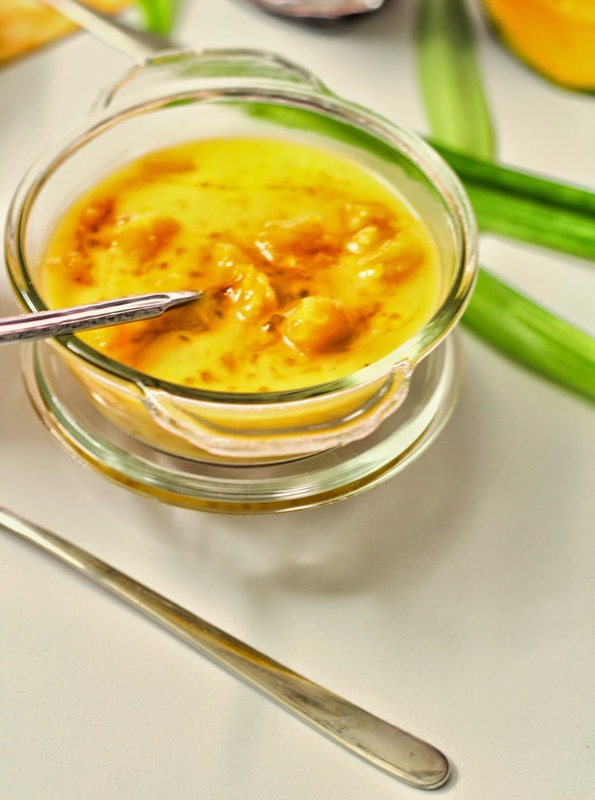 Simmer palm sugar with enough water for a thick syrup and serve with pumpkin sago. Hi Nava, totally agreed with you. Blogging is not as simple as cook, click and post. It takes patience, planning, organizing, skills in cooking and photography as well as presentation. Next session set your camera on remote control or timer on a tripod and you will have beautiful pics of yourself cooking in the kitchen, hahaha..
love the color of dessert. going to try soon. I'm laughing my head off! That could have been my husband taking pictures! Unlike you, I get upset with his photography skills! He's trying to improve though! Lovely dessert and I absolutely love the bright and colorful pictures! You know, maybe one master photographer is enough for a family! 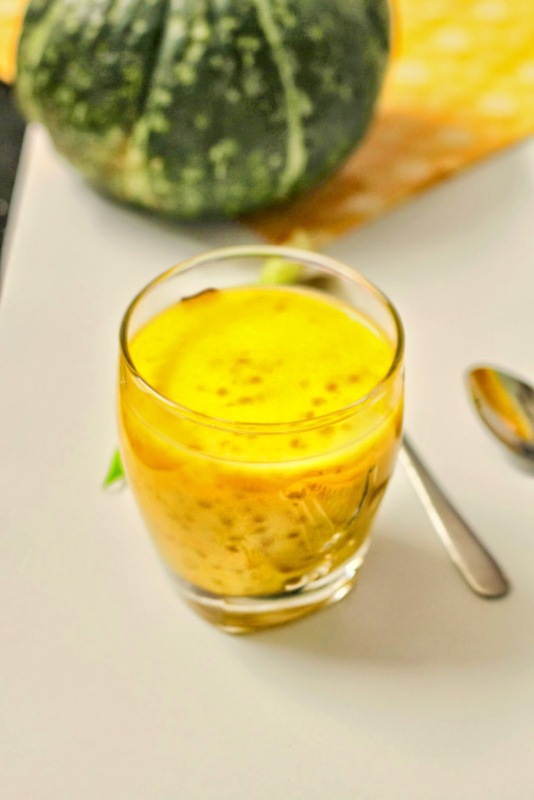 I love the idea of using pumpkin puree for the sago...beautiful dessert Nava. Love the combo....... Dessert looks super delicious!! This dessert sounds delicious with pumpkin,I've tried the same with mango. And I agree, it is so difficult to organise everything, nothing is simple in blogging! Your sago dessert looks wonderful - it's been so long since I had sago. And your photos are lovely! yes Nava...Food Blogging is not as simple as that...Your Pumpkin Sago dessert is inviting! 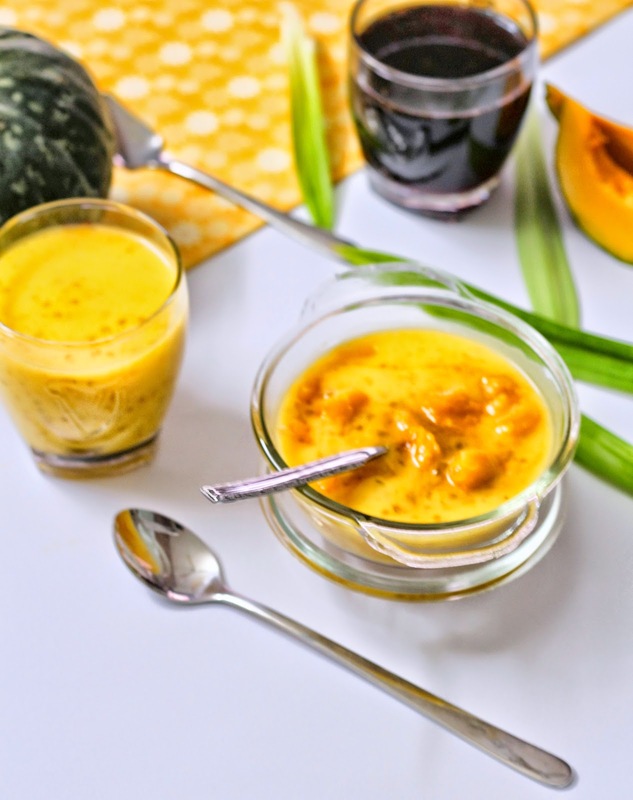 Wow, the idea of using pumpkin with sago is wonderful! Your dessert/photos look so inviting! Your hubby's photography moments sound exasperating! ;) The same would have happened to me too if I had let him. He's more of a landscape person!! i love mangoo and sago dessert that commonly found in a chinese restaurant, i think i'm gonna love this pumpkin sagoo even more!!! I couldn't stop laughing when I was trying to visualise your reaction on looking at the photographs:-) I think bloggers are multi talented and it requires a lot to keep at it for a long time. I love sago pudding especially with palm sugar. Have to try this one out. That colour is lovely!